My wife Angie and I used to have a ton of fights about money. In fact, those money fights were just one issue that almost cost us our marriage early on. But we learned how to overcome our differences financially and started working together, and we haven’t had a fight about money in well over a decade now! Find out what we needed to do to solve our problem with money fights. Commit to working together toward a solution. Then, do the hard work necessary to overcome our problems. It definitely took some time and effort on our part. These things are not always an easy fix. Angie and I attended a popular financial course and eventually got marriage counseling to tackle other problems we needed help with. But in the end we did everything we could to work together to overcome our problems and can’t remember the last time we fought about money! Using the seven steps below, you can achieve this in your own marriage too! In this article, I’ll show you 7 things that we did to overcome our money fights. I’ll also throw in a couple of awesome resources that we used that helped us out tremendously and still refer back to from time to time. Here are the 7 easy steps to stop money fights for good. If you have any you would like to add to the list, leave a comment and let me know, I’d love to hear your thoughts! One of the biggest problems I’ve seen with my readers when it comes to money fights, is that they have no plan for their money. When there is no plan, as in a written budget along with a plan for getting out of debt, then chaos reigns. And when there is chaos in a marriage, there will be fights. To eliminate the chaos, both spouses should agree to sit down and make a plan for their money. Learn how to make a budget, talk things out, and come to an agreement on how the money should be used. When there is a good plan in place, there is less chaos that can potentially cause a money fight. 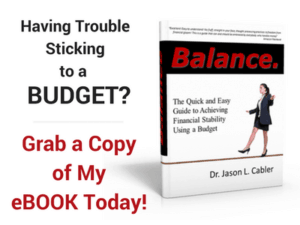 You can access my free printable budgeting sheets and “Debt Rocket” debt planning sheets here. Living with a lot of debt can be very stressful. Believe me, I’ve been there! Constant stress from worrying about credit card bills, car payments, and other consumer debt can take a serious toll on your marriage if you let it. When you’re always worried there’s not enough money, it’s easy to take out that stress on your spouse. 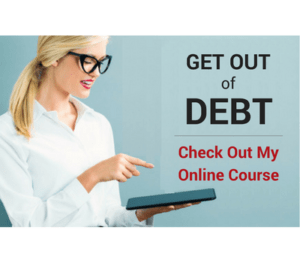 Living within your means is all about learning to get rid of the credit cards, pay off the consumer debt, and never spending more than you make. I can tell you from firsthand experience, this one tip eliminates a ton of stress. When you got married, you became one, so act like it! Each spouse’s paycheck should go into one central account and be distributed from there. This allows each spouse to know where the money is going and stay accountable. There is no “his” money and “her” money. There is no “her” bills and “his” bills. When you’re married, all the money belongs to both of you. Combining your finances means you have to communicate about where the money is going and why it’s going there. Keeping a joint account, along with a plan like I talked about above, opens the lines of communication and helps eliminate mistrust and money fights. It’s ok to have a little fun money of your own. Each spouse should have an allowance to spend as they please without having to talk to the other spouse. Of course the allowance should be part of the budget, and should come out of the joint account that all money is distributed from. Since there is a budgeted amount, it helps eliminate overspending. It ensures that each spouse is treated fairly, instead of one spouse doing all the spending and the other ending up with very little. It helps each spouse spend in their own way. For instance, I usually save most of my spending money toward an item that I want. On the other hand, my wife spends much of hers immediately on smaller items and eating out with friends. Both ways of spending our allowance are perfectly ok. This can be a hard one for some couples to overcome. But when it comes down to it, you have to be able to trust your spouse. Both spouses should have password access to all bank accounts and know what’s going on in each one. If your spouse can’t get on board with that, then they are either hiding something or have serious trust issues that need to be addressed. This also comes down to accountability. Keeping financial secrets is never good, and can lead to a spouse keeping a secret credit card, hiding an illicit relationship, running up tens of thousands in secret debt, and of course, money fights. I’ve seen it happen more than once, and it’s never pretty when the secrets finally come out. Just the same as preparing a monthly budget and a get out of debt plan, it’s also wise to set financial goals together. There is something about giving that brings forth unity in a marriage. When you’re both on the same page about giving, it shows that you can agree about other areas of your financial situation as well. As Angie and I learned to use these seven tips in our own marriage over the years, we eventually got to a place where money fights just don’t exist anymore. In fact, I believe these 7 tips work so well, I teach them in my online course. Honestly, it really wasn’t hard to eliminate our money fights at all. It just took two people who were willing to work together, figure out what was missing, and correct the problem before it got out of hand. 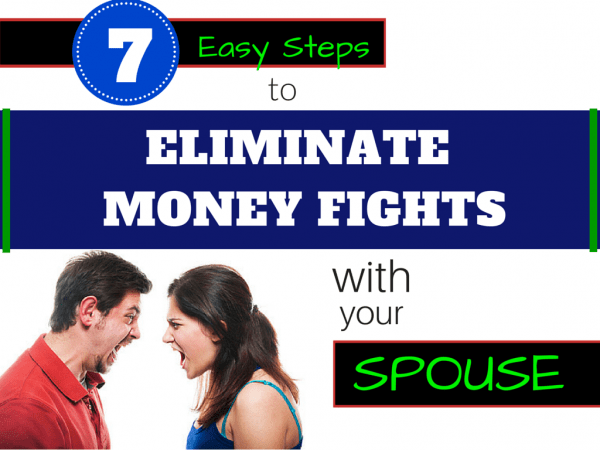 Using these seven steps, you can eliminate money fights too! Just be diligent, be willing to work together and you will see your marriage and your financial situation grow in ways you never thought were possible only a short time before! Question: Do you have any tips of your own for eliminating money fights in your marriage? 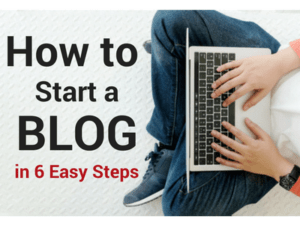 Leave a comment and tell me your favorite tips! You can hack and break into any bank’s or Secured ATM Machine without carrying guns or any weapon. It is simple!!! I say why don’t we tapped from those government money too? Spouses really need to be on the same page when it comes to their finances. That means discussing what they both want and maintaining open communication with each other. It’s good to set realistic financial and budgeting goals and working together to achieve them. Anything you can do to get on the same page with your spouse is always going to result in less fighting and a better overall financial life. Setting goals together works! Setting financial goals and sticking to them is a must for couple to work out and feel good about! I know it works for me and my wife! Communication seems key to most thing’s, have a great day on purpose! One thing I think you need to add to the list is “have a willingness to compromise.” When you have a finite amount of financial resources, both people are not going to get everything they want. And unless each person is willing to sacrifice what they want for something their partner wants, arguments will continue. Wisely said Travis! We’ll call that Easy Step #8. I’m sure you and Vonnie both have had to do a lot of compromising over the last few years. You’re hard work is definitely paying off!